Rodolfo “Rudy” Arias, a member of the famed 1959 Go-Go Chicago White Sox, passed away on Friday January 12, 2018 in Miami, Florida according to a family member. The Cuban native was 86. The lithe left-handed pitcher played only one season in the major leagues, but what a fine one it was. Signed by the White Sox in 1952, Arias fought injuries while working his way up to the American League pennant winners in 1959. While Arias was eager to make an impression for his spot on Cuba’s legendary Havana professional winter league team, his fortune changed quickly before he could even get on the field in front of Gonzalez. A freak accident while arriving at the ballpark derailed his chance for a spot on the Havana club. “I broke my arm after I slipped on the concrete [at the ballpark] and they sent me home,” he said. 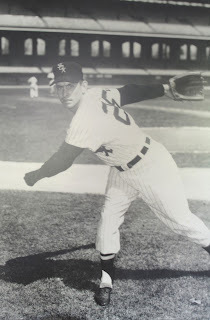 Despite his injury, Arias returned to the White Sox in 1954 and they promoted him to their minor league team in Waterloo, Iowa. He survived by only using his fastball for the next few years until his arm sufficiently healed to feature his signature curveball. By 1958, he was knocking on the big league door at Triple-A in Havana. He impressed the White Sox brass when he threw a no-hitter against Rochester. In 1959, Arias got his big break with the White Sox, making their team out of spring training. His left-handed arm gave manager Al Lopez versatility in the late innings out of their bullpen. One of his first introductions to the unwritten rules of major league baseball was when Lopez directed the rookie to drill opposing New York Yankees pitcher Ryne Duren. He fondly recalled the rest of the battles that the White Sox had with the Yankees that season, citing them as their toughest competition en route to the American League pennant. He proudly told how he foiled Mickey Mantle on a bet from teammate Jim Rivera. Arias was on the roster for the 1959 World Series; however, he did not see any action against the Los Angeles Dodgers. He received a full share for his efforts. Over 50 years later, he marveled at both the spectacle of seeing over 90,000 people at the Coliseum, and the amount of his share if he played in the World Series now. “I didn’t believe it,” he said. “All around, wow – 93,000 people! There was a lot of noise. It was different pitching there. In the off-season after the World Series, the White Sox traded Arias to the Cincinnati Reds. They sent him to Triple-A in San Diego in 1960. He spent three years in their minor league system and crossed paths with many of the Reds’ future stars including sharing a dugout with Pete Rose in Macon, Georgia. Arias had one last hurrah in 1961 while pitching for the Mariano team during the final season of the Cuban professional league. He had enough life in his arm to throw an 18-inning gem and lose! On the other side of the hill was a young Luis Tiant. Struggling with injuries, Arias never returned to his major league form; however, he played in the minor leagues and Mexico until 1967. He settled in Miami working in construction and later as a security guard before retiring. He passed the family legacy to his son Rudy, who was a minor league catcher and a long-time major league bullpen catcher. One of his highlights included earning a World Series ring in 1996 with the New York Yankees. In retirement, Arias received fan mail from fans all over the country, which he kept neatly in binders in his home. He marveled how they came from such far off places like Alaska. “I get a lot of letters now from all over, more than when I played,” he said. Rudy Arias was one of the pre-1980 retirees who didn’t receive an MLB pension.